The doc said it was an STD. I laughed. Why? The answer my friends lies in the numbers. Of course the doctor wanted me to have an awkward conversation and prescribed some anti-bs. I, on the other hand, was very confident, so took a different line – “Do the test again,” I said. Any blood or urine test has a reference range – that is a range of concentrations at which it is negative and above (or below) at which it is positive (some tests are just shown as a “+” or a “-“ as in home pregnancy kits rather than a number). It is up to the doctor when they receive a positive test result how they interpret them. They may chose to believe the test has diagnosed a disease, they may choose to do more tests in order to “confirm a diagnosis”, or they may choose to think that the results are erroneous. I really don’t know how often they choose any course. What I do know, is that every school child should be taught about false positives and false negatives. A false positive is simply a test which says that you do have the disease when you don’t. A false negative is simply a test which says that you do not have the disease when you do. 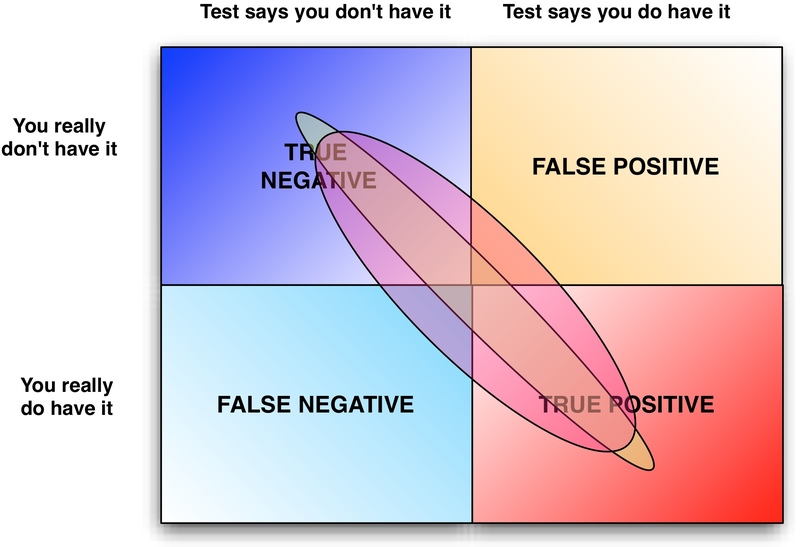 What we want is a test with as few false positives and false negatives as possible (the “narrow” ellipse in the diagram). In reality, tests vary a lot. Ideally every test result will lie in the dark blue (true negative) or dark red (true positive). In reality, there is always a few false positives and false negatives [A good test would have few (the narrow ellipse), a poor test would have many (broader ellipse)]. How often do false negatives and false positives occur? I don’t know the exact number, but the answer is “frequently.” The more tests done, the more false negatives and false positives there are. For a test like chlamydia which is ordered by doctors even when it is not asked for by patients (grrrr!) my guess is that it is very frequent. Consider this – if the boffins who developed the test for chlamydia decide on the threshold for positivity (eg the concentration above which the test is called “positive”) such that the test correctly identifies as having the disease 99% of those that have it (ie only 1% of the “positives” are False positives) then for every 100 people diagnosed with the disease, 1 does not have it. If it identifies correctly 99% of those who do not have the disease as not having the disease then 1 out of every 100 people who are told they do not have the disease actually have it. If, on any given day, 1000 people in New Zealand have the test. For a moment, let us assume that of those 1000 people, 100 actually have chlamydia. With the numbers above it means 1 person will be told they have chlamydia when they don’t and 9 will be told that they don’t when they do! Telling someone they have a disease when they don’t matters most if the treatment for the disease is dangerous and/or expensive, or the psychological or social consequences for the individual are serious (eg divorce!). Telling someone they don’t have a disease when they do matters most if the failing to treat could lead to more serous healthy problems and/or costs for the person or their community (as with an STD). All these factors have to be weighed up when deciding on test thresholds and on whether a test should be made available in the first place. It is why, for example, we don’t routinely screen for prostrate cancer – the test has too high a likelihood of false positives. Recently in the media there was concern over screening for breast cancer in Southland. Some women had received negative readings of mammograms, yet later were found to have breast cancer. Was this because of poor reading of mammograms? The answer appears to be “No”, the “False negatives” were at the rate expected (See http://www.health.govt.nz/news-media/media-releases/confidence-southern-screening-programme). For the record – the second test was negative. Kidney Punch is brought to you by Dr John Pickering, a scientist researching the diagnosis of kidney attacks and heart attacks, who wants to be public about his publicly funded research and have a say about a few other matters he thinks are important.